GIFTS:Every pair of our canvas shoes with a pair of socks for you as a gift! MEMORY FOAM INSOLE: Our insoles are made of memory foam cushioned , soft and comfortable. LIGHTWEIGHT EVA SOLE: EVA soles are light weight make your feet free of burden. 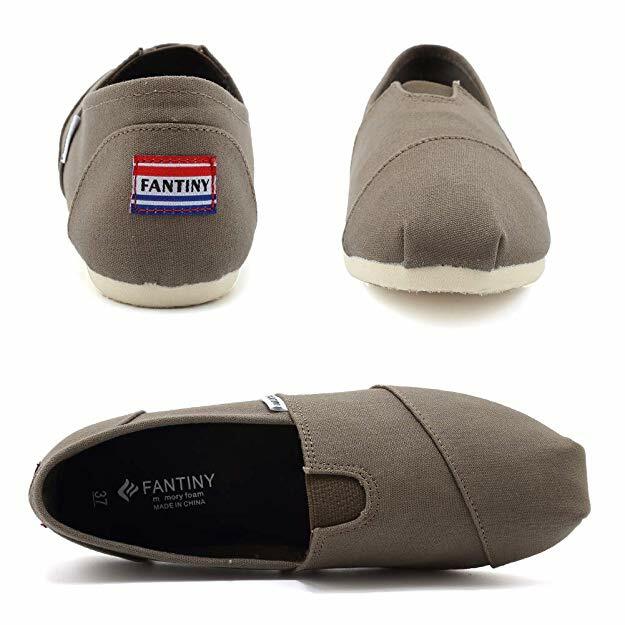 CONVENIENT: Classic and Simple slip on design,elastic U-shape on uppers for easy on and off. OCCASIONS: Suitable for Girls and Women in many occasions, walking ballet, parties, working, shopping,dancing, parties, KTV, jogging, gardens, parks, etc. Upon putting my foot inside of these shoes I had instant comfort. My first wear I took them for a grocery run. A busy Friday turned into an even busier Friday evening when we decided to knock out weekend errands early and have the weekend to enjoy as a family. I found that the cushion inside was great. Soft and extra comfy I found that my heels were not irritated at all and even after several hours of walking around stores I was still comfortable. These shoes are some of the lightest I own and I can compare them only to bedroom slippers which are typically not appropriate for errands or any other chores for that matter. I gifted a pair to my mom who has been wearing them and is super comfortable as well. A deal at just $9,99 per pair on Amazon there are several sizes and colors to choose from. I love the black pair because they go with everything. I have paired them with leggings and skinny jeans often since getting them and love that they are holding up for my busiest of days.